This is my grandmother, Joyce Titelman Williams, on the beaches of Trinidad in 1942. This photo was taken before the births of Joyce’s two daughters, when she was a carefree newlywed who typed letters on thin sheets of airmail paper, assuring her well-heeled mother that despite the house-dwelling insects and shoddy appliances, island life was “swell” and Herb was learning a lot at his new job as photographer for the US army. Or even now, I could write about the fruit flies that mill around our indoor compost bucket like a singles bar, and our own shoddy appliances (our stove has been broken since before Christmas), but life at 6512 feet with a rumpled blanket of snow is fabulous and Dan is learning a lot at his new job as weatherization auditor. When I explained to Col and Rose last week that Grandpa Herb was dying, they asked why, their little noses crinkled in a frown. Because he’s very old, I told them, because he had a long, good life. He played tennis and traveled by train and took pictures from airplanes and walked his daughters to school and led hikes on Mount Tamalpias and read to his grandchildren and swung a hammer and napped with his cat and studied native plants and kept a journal and ate 13-bean soup with a wedge of crusty bread and filled his fridge from the Berkeley farmers market and did yoga and danced with his wife. And in giving my kids, 5 and 2 ½, the Cliffs Notes of an old man’s life, I was reminded of the technicolor coat of Herb’s 95 years, which had more recently faded to a sun-worn skein of fabric, unraveling by the day. By the time Col and Rose met their great-grandpa, his rock solid mind was starting to erode into misplaced pebbles and so much earthy dust. With Herb’s passing, all of our oldest, yellowed brain files featuring him are starting to brighten. The nursing home years were really so brief and like the foam on a beer, easily skimmed away so that what remains is a robust brew, stout and rich and full of intricate flavors. 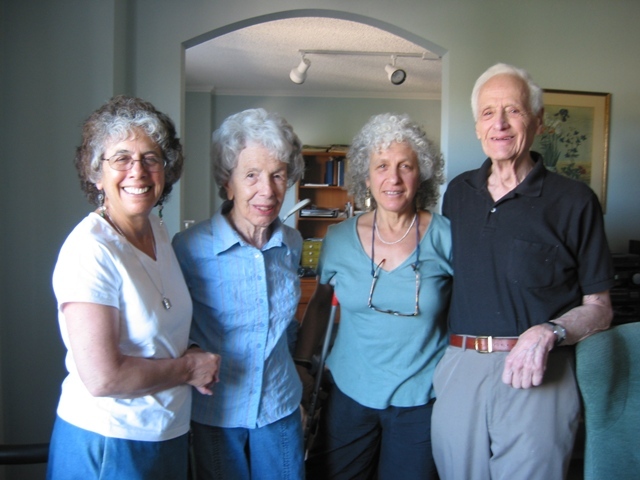 These memories of Herb—smacking tennis balls, pointing out Serpentine rock on Mt. Tam, cracking open a roomful of family with his quick wit—will guide me as I share with the kids who their great-grandfather really was. Grandma Joyce turns 91 this month, and I hope that her crazy quilt of memories slowly unfurls, so that the colorful days on Trinidad start to cover the more difficult recent memories of her husband. And as she goes to flower arranging classes, in-house concerts lined with wheelchairs, and is visited by boisterous great-grandchildren, may we, her descendants, remember that inside her still lives that island vixen regarding her beloved behind the lens. oh goodness. Let me stop the tears here before writing….this was such a beautiful post– you spoke with truth and clarity and perfect details– the mark of someone who knows how to use words well, and you honor your roots while acknowledging your future. just lovely. 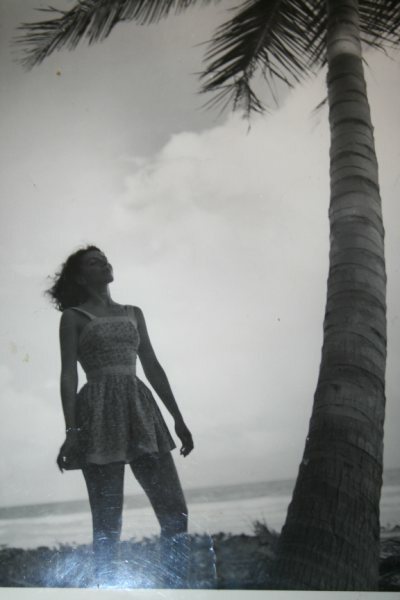 My mother grew up in Havana in the 40s, and I have an old black and white photograph of her, also in such a tropical setting, palms, beaches, that windswept hair. It’s nearly the same photo; practically the same pose. Wild. I asked my mom about it, why she was always so dramatic in all her youthful photographs. She said that you didn’t take pictures of everything like we do today, it was a special occasion when the camera came out. You stood for a picture, you put yourself in it the way you wanted to be remembered. I love this picture of your grandmother. So stunningly written. My favorites: the intro about the letter writing to the parents (so true! I’ve written those too), your description of why he is dying to your kids and the beer metaphor. Makes me want to know your grandma and grandpa. There’s something remarkable about that generation. This is just so magnificently and gorgeously rich. Thank you for sharing it. Old photos are so powerful and evocative. Love this. And I hope it eases your loss. That is beautiful Rachel. Makes me want to call Mom. Rachel, this is so beautiful. My own grandfather just turned 101, but his health is beginning to fail, so everything you wrote here felt close to me. I have tears in my eyes. Thank you for sharing a little bit of your grandparents’ lives. I’ll be thinking of your family. next time someone takes a picture of me… I’m going to pose like Joyce. That photo is spectacular.